"Tell me, Mr. Brown, what's wrong with folly?" Sometimes I cling to my Girlhood like a life raft. I strap myself to it with Optimism and Enthusiasm and Naivete. It's a defense mechanism, admittedly, but one which I attempt to handle with adroit self-awareness... never allowing my passions to become mere single-minded pursuits, never letting my playfulness regress to a state of immaturity. Being a grown-up-girl comes with a territory. I enjoy wine at dinner, but a midnight trip to 7-11 with Jonathan usually ends with me sipping a Capri Sun. I am efficient, capable and self-assured at work, but when the weekend comes I'll play games online or read my Marie Claire or rip off my left arm in order to keep from doing the dishes. Recently, I was excited to learn that my American Girl Doll can be sent away to a "hospital" and be fixed for a nominal fee. Now, one might wonder why a 24-year-old woman (yes, I still have 17 days until my birthday... I am not a quarter century old yet!) would care about such childish folly. But, like Velvet Brown's mother, "I, too, believe that everyone should have a chance at a breathtaking piece of folly once in his life." Of course, I wouldn't call shipping my doll to the repair shop "breathtaking," but Samantha deserves the gesture anyway. 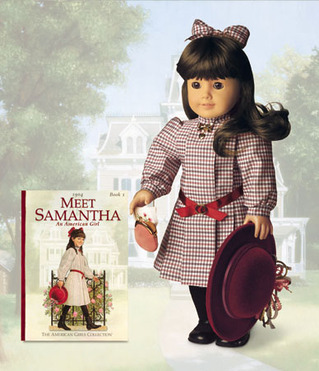 Samantha was a major player in my long, fun-filled childhood days. But, with the dawn of adolescence, she was soon relegated to a spot on a shelf in my room. And then to a box. And then to a closet. And now, when I do remember to pull her out for some fresh air, her skin is dirty and her hair is inexplicably knotted. Her pinafore is wrinkled and her lacy socks are torn. I ought to have stored her better in the first place, but back then I was in a rush to grow up. As irony would have it, in my quest for womanhood I had no time for responsibility. At any rate, my Samantha is a mess. Thankfully, the doll makers have allowed for this exact situation. On their website, they link to the American Girl Doll Hospital, one which operates under the slogan, "Because little brothers happen..."
For only $39 I can get a replacement head restrung to my sweet Samantha. Imagine! Clean skin. Silky hair. And for a few dollars more, she'll come home wearing a hospital gown, a hospital bracelet and carrying a balloon. Hmmmmmm... the fact that I even remotely want these inconsequential knickknacks for my dolly means that I'm not exactly a woman yet. Actually, that leaves me feeling relieved. What good is life, the single shot we get here on earth, if it's not fun? And why should becoming a woman be synonymous with the end of silliness and giggling and play? Even if Samantha, once she is tidy and home from the hospital, sits elegantly in a corner somewhere for the rest of my days... I can still get that reminiscent rush when I see her. Knowing that she was my fellow trekker up Mount Everest, my pioneer daughter as we conquered the Oregon Trail, my understudy on Broadway... these memories will help me retain my youthful exuberance. And, if all goes according to plan, one day she'll pull a Velveteen Rabbit and spontaneously animate under the power of my love. To prepare for that moment, there's no doubt she deserves a stint at the hospital, a new head, a nightgown and a whole bunch of beautiful red balloons. And so will continue the fight for my entitlement to folly.